The crispy cubes of baked tofu (you’d never believe they weren’t fried!) are the star of this vibrant dish, but we can’t forget the supporting players. Steaming sushi rice sets the scene, while quick-pickled radishes, carrots, and jalapeños add a little tang and heat. Cooling cucumber, fresh cilantro, and a creamy sriracha aioli round out the ensemble! Preheat your oven to 450°F. Drain the tofu and cut it into ½-inch cubes. In a medium bowl toss the cubed tofu with salt, pepper, and potato starch. Be sure to evenly coat each cube! Line a baking sheet with the parchment paper, and lay out the tofu cubes, making sure they don’t touch. Bake until crisp, 30 to 35 minutes. While the tofu is baking, add the sushi rice, 1 ¼ cups water, and a pinch of salt to a small saucepan. Bring to a boil, cover, and reduce the heat to low. Cook the rice for 15 to 20 minutes, checking once or twice toward the end of the cooking process to make sure the rice isn’t sticking. Remove from heat, and leave covered until you’re ready to serve. Rinse and dry the jalapeño and radishes. Thinly slice both. Peel and thinly slice the carrot. In a small saucepan, combine the sugar, vinegar, and ¾ cups water. Bring to boil over high heat. Once boiling, add the sliced jalapeño, carrot, and radish to the vinegar-sugar mixture. Remove saucepan from heat and let the vegetables pickle. In a small bowl, mix together the sriracha and vegan mayonnaise. Rinse, dry, and thinly slice the cucumber. Pick the cilantro leaves and tender stems; discard the tough stems. Remove the pickled veggies from the brine. 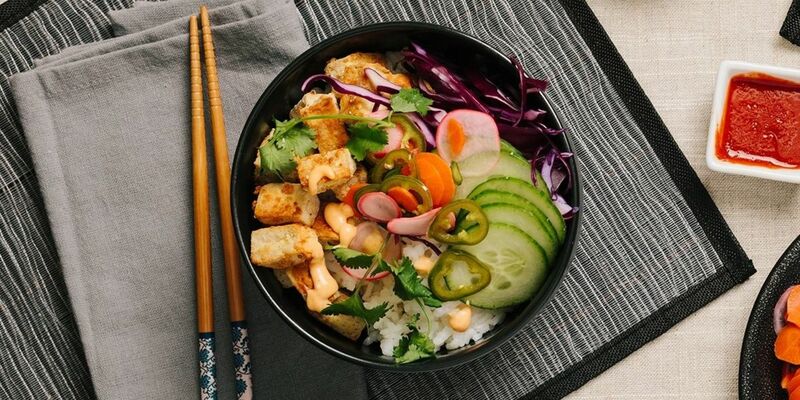 Divide the sushi rice between your bowls and top with the crispy tofu. Garnish with the pickled veggies, shredded red cabbage, sliced cucumber, cilantro leaves, and a drizzle of sriracha aioli. Enjoy!